Near Guildford, Surrey, England Where was the photo taken? Some of the replies below answer the question: "Where was this photo taken?" Others answer the question: "Why was this route taken?" - Ferry Road, Newhaven Road, Leith Walk? Thank you to Forbes Wilson for telling me about the photograph above. "This photo is dated 12th June 1952. I’m assuming the location of this photo is somewhere between Bruce Peebles factory at East Pilton and Portobello. I know the Granton, Newhaven, Leith and Portobello areas fairly well but struggled to identify the location of this photograph. Can any of your readers locate this photograph?" If you recognise the location of this photo, please email me, then I'll pass on your message to Forbes. Thank you. It looks to me as if this photo may have been taken as the transformer passed under the old railway bridge (now demolished) as it was approaching the foot of Leith Walk. That's exactly the place that I had in mind. "100% correct location - a few yards up from Jane Street on the right. I'd like to see more 'Where was this?' photos. It helps to keep the think glands supple." "Could it be Leith Walk, bridge at Jane Street heading towards Foot of the Walk? Compare with the picture below. on whose web site this photo appeared. "Maybe the transformer pic would have been taken from the right hand side of road, by the Scotsman office. The lamp post on the extreme left looks similar style to that in the transformer pic. I see others have replied similarly." "It looks very like the foot of Leith Walk to me also." "It is definitely the foot of the Walk, but I think it is heading south up the Walk." "Sorry, I stand corrected. On closer inspection, it is heading north down the Walk. It seems a strange route from Granton to Portobello though." "Many thanks to your readers, and shame on me for not recognising the location. After visiting my grandparents in Thorntree Street, we would walk along Halmyre Street, Gordon and Manderston Streets and then onto Leith Walk. 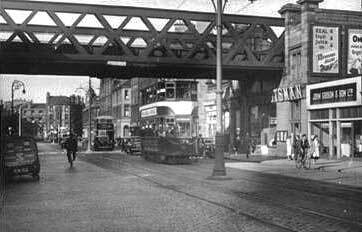 We would turn left and under the railway bridge shown in the photograph, to the bus stop outside the bus depot on Leith Walk. My grandparents also went to their whist evenings in one of the recessed buildings shown on the extreme right hand side of the photograph." I'm still continuing to receive more replies confirming that this photo was taken near the foot of Leith Walk, at the corner on Jane Street. Fife, Scotland, September 20, 2010. Thank you to Brian Swanney who wrote again, in response to Bob Henderson's comment (in 6 above) about the route taken by the load from Bruce Peebles' factory at East Pilton to Portobello Power Station. "I lived not very far from Bruce Peebles' factory. In the 1950s and 1960s, I can remember loads going north down Pilton Drive and on towards Granton Harbour – indeed you and Granton History Group have early photos of loads going onto ships there. I’m not sure I remember any going from the factory and heading south on Pilton Drive where the first thing to negotiate would have been the rise and minor humpback bridge over the railway line before getting down past Northern General onto Ferry Road. I suspect they may have and I just can’t recall. I suppose, if they did go that way, then it would possibly be Ferry Road / Newhaven Road / Leith Walk / Constitution Street / Seafield Rd? I don’t think they would want to go via Coburg St or Gt Junction Street to get from Ferry Road to Seafield Rd. Likewise, I doubt they would much relish negotiating the ‘z’ bend at Trinity Bridge if going via Granton to Portobello. I’ll bet other contributors will have more definite memories!" - too tall or too large to fit around the dog-leg at the N end of Trinity Road, where the Granton Branch used to cross the road." "This picture was taken going under the bridge at Manderston Street, Leith Walk, heading for the Foot of the Walk, and then on to Constitution Street and Salamander Street, then Seafield Road to Portobello." "I’m sure all heavy loads which left the works headed north down Pilton Drive. 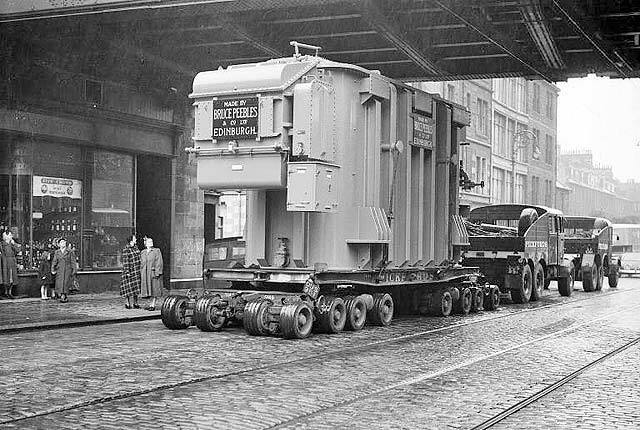 Here is a photograph of a transformer leaving the factory in that direction in 1968. I don’t think that any headed south. Pilton Drive narrows slightly at that point and the bridge would probably not have withstood a low-loader with transformer passing across it. It’s possible that the bridge would have posed potential grounding problems for them too, so I suspect that the more likely route for the transformers to take to Ferry Road would have been via Granton Road. The lifting traffic islands at the Pilton Drive North/West Granton Road junction have now gone, but there is still one reminder of Bruce Peebles to be found in Edinburgh: the middle of the traffic roundabout on Groathill Road North, which has a gap in the centre of it. This was to allow the low-loaders to carry straight on towards Telford Road without having to negotiate the roundabout." "By a process of elimination, the route taken by the transformer shown in the 1952 photograph would have been from Bruce Peebles via Pilton Drive, Pilton Drive North, West Granton Road, across Granton Square, Granton Road, Ferry Road, Newhaven Road and Pilrig Street to Leith Walk." Harry Hunter also identified where this photo was taken. "This photo was definitely taken near the foot of the Walk, at the corner of Jane Street." "It is fun for me to identify this location. I lived just to the north of where this photo was taken from. The last street off Leith Walk on the right before reaching Leith Railway Station at the 'Foot of the Walk' is Crown Place. That's where I lived until 1949. The bridge was taken down some years later." "I also grew up near where this photograph was taken. The railway bridge was about half-way between our flat in Leith Walk and the Foot o' the Walk. I walked under it daily in fear of the pigeons nesting in the beams under the deck. Thankfully the seemingly inevitable never happened." "The bridge in this photograph was in Leith Walk at Jane Street hidden by the large transformer. The shops beneath the bridge provide the clue. The one on the right is now Rikki's Music shop. You may find more information about the route from the Edinburgh Evening News Archives or possibility STV or BBC Scotland Archives this would have been a great news story of the time." Thank you to Steve Begg for also coming up with the same answer. "The transformer is heading north to the bottom of Leith Walk. The entrance to Jane Street, where my grandmother lived, is obscured by it."